How can I resize an external USB NTFS partition? I have a new USB drive which came with a single NTFS partition. How can I shrink that so that I can create an ext4 partition? gparted does not seem to have the "Resize" option highlighted. Unable to find mount point. Unable to read the contents of this file system! Because of this, some operations may be unavailable. The following list of software packages is required for ntfs file system support: ntfsprogs". However, with the partition mounted, I can read & write to the file system on the drive just fine, and ntfsprogs is installed and current. You will not be able to resize the drive while it is mounted ie: in use - boot into Gparted Live CD, attach the drive (make sure it is not mounted!!) and then you should be able to resize the drive as you want. Using gparted, you should start by right-clicking and choosing "Unmount". This will allow you to edit the partition. You should then be able to use the resize command as well as be able to make new partitions on the USB drive, and should allow you to create an ext4 partition alongside the NTFS partition. Mind that the mountpoint "/media/External USB" is different on your system and depends of the name you gave your drive. If you are not sure the mountpoint of your external drive is shown in System -> Administration -> Disk Utility, or with the command mount -l in a terminal. GParted or Nautilus will not let you unmount the drive without removing the USB drive as well. 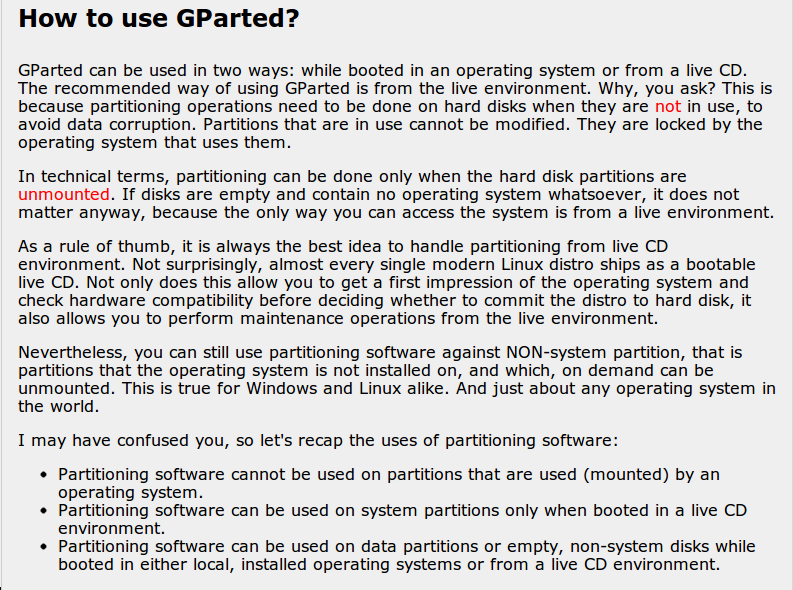 Once the drive is unmounted you can resize or reformat your partitions with GParted or any other partitioning tool. You'll need to unmount it first, probably best achieved through Nautilus, and then you can open GParted and resize the partition. Here's my experience...your mileage may vary. I had an external USB HD, primarily used for massive backups. But when I plugged it in, two logical drives appeared: this annoyed me. They were formatted ntfs. After this, I could use the Gparted utility from the Ubuntu menu to delete the partition, reformat etc. For the record, I tried unmounting with Nautilus: didn't work. Then the drive didn't show up on Gparted at all! Hope this helps/works for you. run chkdsk /f on windows before resizing in ubuntu. If there are unresolved errors on the filesystem, resize option does not work. I disagree with the comments that you need to perform this operation on a Live CD. You're talking about an external USB drive, not a system drive. You definitely can do this operation from your installed system. If gparted is reporting this error, you might have something wrong with the ntfs partition. You should probably run sudo ntfsresize --info /dev/sdX1 on your partition. This tool (it's used by gparted itself to do the resize) will report if there's something wrong with your ntfs partition that should be fixed with chkdsk /f on Windows. Or you can use gnome-disk-utility found in Administration > Disk Utility. It will list your usb in storage device. Not the answer you're looking for? Browse other questions tagged usb-drive ntfs gparted or ask your own question. Why does my NTFS partition mount as read only?